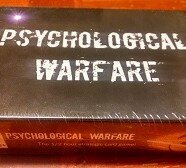 Some of you may recall that a couple Princesses playtested DPH Games Inc.’s Psychological Warfare last year, and I did write a review of it here. You also might recall that Alana wrote about their Kickstarter for this game which, by the way, was a success because here is a photo of the finished product fresh in packaging! Fresh in box, ready for some happy fun crazy times with friends! The President of DPH Games Inc., Dan, was also kind enough to present me with a little pack of promo cards (including the Suppression card, “Not thinking about it not thinking about it not thinking about it…”) and replacement cards for a few cards in the box that needed fixing due to a manufacturer’s error. Princesses in attendance at Running GAGG were also invited to test out a new game in the making about cats hunting, catching and eating birds. My status as Crazy Cat Lady demanded that I check out this game on Sunday after most of the con madness had settled. The idea of the game is pretty simple; you are a cat and you want to catch and eat more birds than the other cats. At the beginning of the game and each turn, four birds are laid out on the table from the bird deck. Some birds are only worth one point, so you can Catch them right off the bat. Others require you to Stalk your prey first, learn their birdy ways, and then Catch. The Nest card in the photo below shows that if you Catch the bird in the Nest, the Nest gives that bird an additional point value. The upside down numbers (2, 6, 4, and 4) represent the value of the bird if you Play with your food after the Catch and before you Eat it. However, the Play card can be problematic because another cat can Steal your bird while you play, or they can Play with you enough to distract you and the bird flies away. Each players gets to pick a cat and their color deck– The Black Cat gets the Black deck, Barn Cat gets a Yellow deck, and so on. Each cat has something a little unique about them. I picked the Black Cat, pictured below. I also suggested another concept for a playable cat: Piano Cat. Special ability to be something like, “Sing us a song, you’re the Piano Cat.” Cats DO love to sing us the songs of their people, after all, and it would be a good distraction type of move! Each cat deck has cards you can ALWAYS use, like Eat and Nap, because cats can always eat and sleep. Eating is an action you can take once you Catch your bird, and Napping allows you to pick up your discarded hand. There are other cards like Lick that provide excellent misdirection. All it does is give your cat a bath, but it can be incredibly helpful if another player thinks you’re trying to Catch or Steal a bird and it can cause them to waste a good card. Catching birds can be tricky too if more than one cat has the same number of Stalk cards placed on the same bird; if two cats try to go in for a Catch on the same turn, the bird flies away. Coincidentally, that is the move a player used during the play test to secure a victory– he had 13 points, I had 8, Dan had 7… and it was down to the last bird standing. I was really impressed with this game so far, and Dan said that play testing at the con helped DPH Games Inc. improve the style and flow of play by leaps and bounds. It is a lot of guesswork and reading other players to see what they will do, and it is pretty cool that you can trick and misdirect people with only so many moves you can do. I’m really looking forward to playing a more polished version of this game, and I hope it comes out as fast as Psychological Warfare! I also like the title they’re playing with for this new game… “Flip the Bird.” It’s cheeky. One last thing– if you are native to the Capital District area of NY, Dan tells me that sometime in the future he will be visiting Foam Brain’s game store in Troy sometime in the near future. If you’re a fan of DPH Games Inc. or you are just curious, visit a local game store and meet a new person! Details to follow. Dan from DPH Games Inc!